Well we can’t quite believe what just happened! To say we have just had one of our best weekends of racing ever is an understatement. After 10 weeks of injury hell, Scott was back racing for the first time this year at round 1 of the 2015 4X ProTour at Winterberg in Germany. The event, held as part of the Dirtmasters Festival is always huge. Big crowds, 3 days of action and a fun track to get the season started. For Scott though, it was always going to be a tough weekend. With a separated shoulder and a Prolapse L4/L5 disc in his back, this was going to be a real test of where he was in the recovery process. Yeti Racing UK team were expecting him to qualify and then see what happened but things went pretty good for Boom Boom. In qualifying on Saturday, a clean run gave Scott 3rd overall which was so unexpected, Scott couldn’t quite believe it! After a good meal and a decent night’s sleep we were back on Sunday to see what would unfold. Scott won his first round of racing, his second round of racing and he won the quarter final. From here on it was going to get tough. In his semi final, Scott rode a defensive lap and held on to 2nd position. He had made it into the final! In the final, he knew he had a problem. His back was now hurting and his gate just was not on point at all. He came out of the gate in 4th then on the first turn swooped low, assuming the other 3 riders would make some contact. They did and Scott was away in 2nd, chasing the leader Quentin Derbier. Scott was all over his back wheel but at the finish line could not find a way past him. 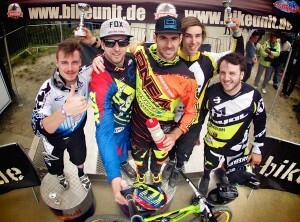 It was 2nd for Scott at the opening round of the 2015 4X ProTour. It didn’t matter though. For Scott this result was very much unexpected and it felt better than winning. He was racing again and still after all the injury problems, very much still in the hunt for the 2015 4X ProTour overall crown. The next race is on June 6th at Fort William for round 2 of the 4X ProTour in front of the home crowd. With another 10 days of rehab under his belt, Scott should be in even better shape to go racing. See you all at the Fort.